We hope you’ll enjoy these great coupons as much as we’ll enjoy serving you. Look out for more great deals to follow. Refer to each merchant’s website for any additional info you may need. Please tell your friends and family to sign up too. Next year you might come back as our Grand Prize winner! 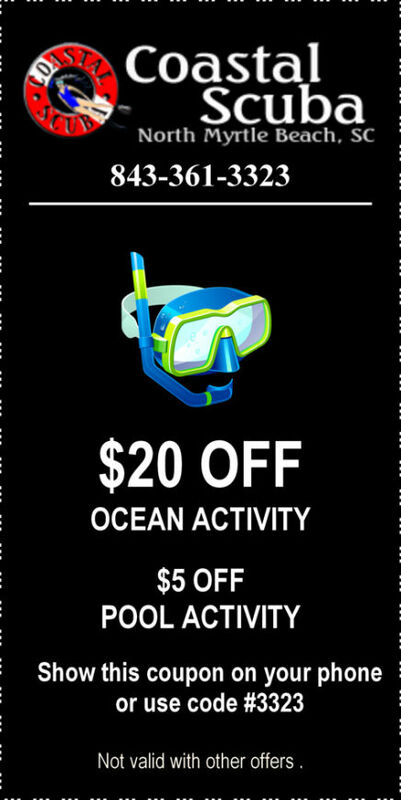 Coastal Scuba is a PADI certified dive training facility. With a 10,000 gallon pool on site, and a wide assortment of ocean training locations, Coastal Scuba offers training for the beginner or the advanced diver. Coastal Scuba offers a wide selection of charter options, from private vessels to open boats. Dive site range from shallow 1/2 day excursions to gulf stream overnight adventures. 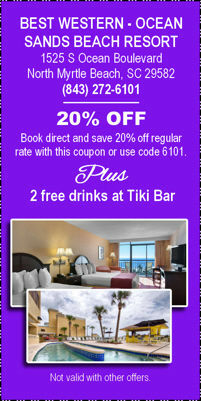 20% OFF when booking direct with this coupon. PLUS 2 Free drinks at the Tiki Bar. The BEST WESTERN Ocean Sands Resort Hotel in North Myrtle Beach SC has the relaxed vacation atmosphere and friendly service of a family owned hotel with the security and peace of mind of the Best Western national chain.Accommodations feature 95 oceanfront one and two room suites and efficiencies, along with 21 side view king rooms, the Best Western Ocean Sands Resort Hotel has a long standing reputation as one of the best beach hotels for your Myrtle Beach vacation. Our quality speaks for itself. We have worked with hundreds of major U.S. retailers over the years and know that every detail is critical to the success of the job. 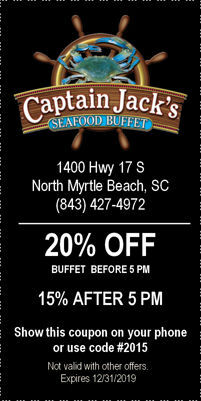 20% Off buffet before 5 PM; 15% off after 5 PM. From T-bone and ribeye steaks and a Prime Rib carving station to baked and fried chicken, even the most demanding appetite be satisfied. Original recipes blend nicely with all your favorites. With seafood in our name, we have to be good. Homemade on-site. Save room for more than one. Do try the Banana Pudding. It’s the boss’s favorite. For over thirty years, Bimini's has been the place where Myrtle Beach locals and visitors alike can find a no-frills, family-friendly oyster bar serving carefully chosen, perfectly prepared seafood without all the silly kitsch of a tourist trap on the strip. As one of our favorite Yelp reviews put it: "This is the perfect dive bar. I mean that in the best way." Coconuts Tiki Bar is opened Seasonally, Spring through Fall, weather permitting. Usually April through October, you can find out updates on our facebook page. We do not have a website. Call during the season, 843-280-tiki!!! You can visit us at Midtown Bistro during the off-season, but call for reservations if you come after 4pm!!! Judy’s House of Oldies of North Myrtle Beach opened in 1987, and was formerly known as the Beach Music Center, which opened in 1963 in Myrtle Beach, South Carolina. We are a family owned and operated music store specializing in oldies, Carolina beach music, and rhythm and blues. Most of our demand is for shag dance music and west coast dancing, as well as east coast dance music. The operations manager, and one of the captains of the Little River Fishing Fleet, Cameron Sebastian, has over 30 years of fishing and scuba diving experience on the Grand Strand. 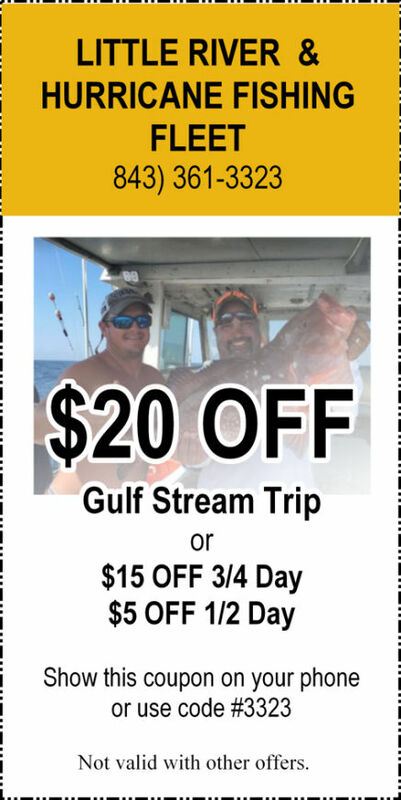 Adding together years of experience from our captains and mates, our goal is to make your deep sea fishing experience the best you have had in the Carolinas! 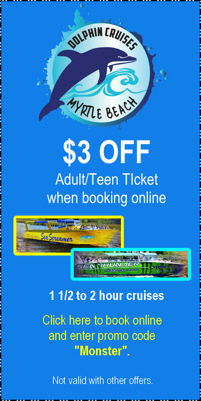 Click coupon to book online, Use promo code "Monster". 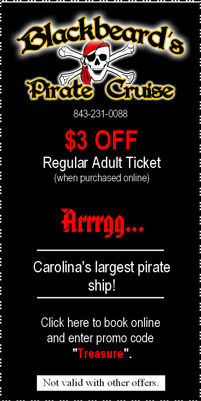 Click coupon to book online, Use promo code "Treasure". Treasure Hunter, for an hour long interactive family adventure that you and your family will never forget! Congratulations on your engagement! 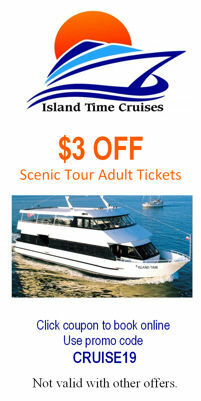 Enjoy your wedding, rehearsal dinner and parties on the area's only dinner cruise yacht. Our wedding planners will work with you to make your event the most memorable time ever! Celebrate with friends and family on any cruise. Entertainment on all cruises! Nothing revives the soul like time on the water.....Island Time! 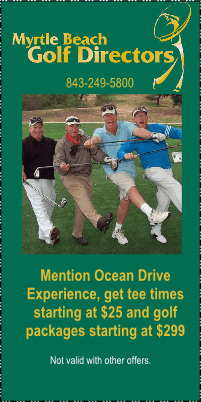 We are a group of captains dedicated to making your vacation one to remember. Come enjoy a bird’s eye view from one of our Coast Guard inspected parasail boats or go for a cruise on a banana boat ride. Whichever ride you choose, we’re sure it will put a smile on your face. Conway: 2001 Hwy 501 E., Conway, SC 29526. Any party is possible at 810. 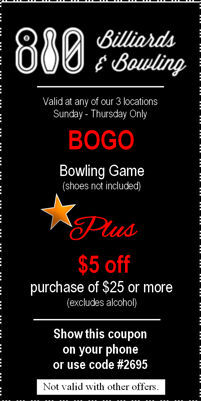 Whether you'd like to bowl, play, eat, drink, or all of the above, we have the perfect venue for your memorable event. Let us take care of hosting your child's birthday, corporate event, or holiday party while you relax and be social. Start with the calamari and save room for the fresh catch at Myrtle Beach's Dirty Don's Oyster Bar and Grill. This Myrtle Beach seafood spot has quite the selection. A night out deserves a drink to celebrate, and this restaurant has the perfect selection of beer and wine to go with your meal. Don't leave the kids at home. Youngsters will love the family-friendly cuisine at this restaurant just as much as mom and dad. When the weather is nice, hurry to Dirty Don's Oyster Bar and Grill to grab a spot on the patio. Dirty Don's Oyster Bar and Grill can provide comfortable seating options for parties of any size. Mammy’s Kitchen has been serving the best breakfast in Myrtle Beach since 1953. Their breakfast buffet has folks lining up to get in the door. And, at a price that’s reasonable, the whole family can enjoy a day starter without breaking the bank. Come see what brings people back year after year and generation after generation. Eggs, bacon, grits, biscuits and gravy, corned beef hash, fresh fruit and more. You’ll love it! Lunch is served daily too!